Growing ornamental plants, herbs or vegetables in containers or planters is often a practical way to decorate a patio or deck. Container plantings, as opposed to traditional gardens or flowerbeds, have additional cultural requirements. Plants in containers can dry out quickly or become waterlogged if there is not adequate drainage. A well-chosen container and liner can address this and provide additional decorative value. Whether the patio planter is plastic, wire, wood or some other material will also impact the type of liner that can be used. Sphagnum peat moss is a lining option suitable for wire or metal planters. Moss-lined planters have a unique, interesting appearance. To line a wire planter or basket with moss, soak the moss in warm water overnight and then squeeze as much water as possible out of the moss before packing it tightly into the container. Make the moss lining 1 inch thick and extend it as high as necessary. This moss lining can wick a good deal of water out of the soil, so frequent watering will be necessary. A portion of a plastic sheet or device that lines only the lowest portion of the planter interior can retain some moisture. Coir, or coconut fiber, can be used in the same circumstances under which peat moss is used, but coir matting tends to have a neater appearance than peat moss. Coir matting is available in sheets or rolls, which then must be cut to fit the containers, as well as in pre-formed liners of various sizes and shapes. Consider lining the interior of the coir-lined planter with a sheet of plastic with holes punched in the bottom for drainage. This will help reduce water loss through the sides of the planter. A simple sheet of plastic or a properly-sized or cut plastic garbage can liner can be used as a planter liner. Simply fit the plastic into the container and fill it with the growing medium. Tuck edges down into the planter so that no plastic shows. At the end of the growing season, depending upon the strength of the plastic, a gardener may be able to lift the soil and plants out of the container for easy cleaning. Make at least one drainage hole at the bottom of the plastic liner to ensure that the plants have adequate drainage. There is also heavy-duty plastic lining commercially available for wire planters. 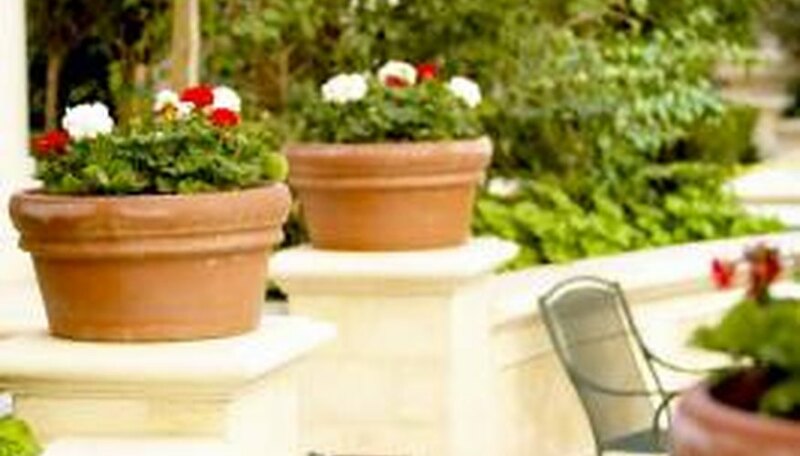 If the planter is permanently affixed to the patio or largely immovable because it is heavy or clumsy, it may be practical to use plastic pot that is slightly smaller than the container as a liner. The smaller pot can then be lifted in and out of the planter and handled more easily, and multiple potted plants can be made to rotate in and out of the planter. Dense or spilling plants can hide the interior container's presence. Galvanized metal liners may be ideal for prized wooden planters that a gardener does not want to rot, especially if the patio planters are a permanent or year-round fixture. Assemble the liner using a piece of sheet metal. Cut the metal, bend edges, bore holes and install pop rivets. Ensure that the liner is watertight by applying silicone caulk to the seams and rivets. If possible, make one or more drainage holes near the bottom of the metal that match up with drainage holes in the planter.